In December, last year, Letizia of reading interrupted. 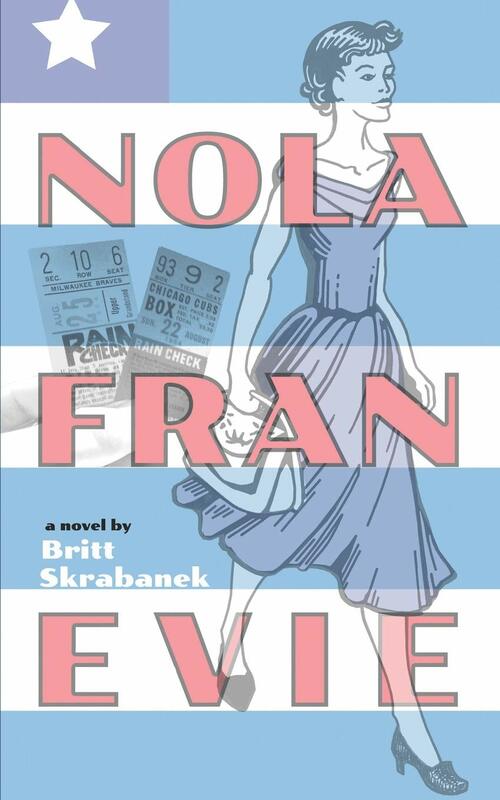 wrote about A Novel Gift. In 1956, Harper Lee received a unique Christmas gift. Her friends, Michael and Joy Brown, offered her one year’s salary on the condition that she quit her job and dedicate herself to her writing. The result was To Kill a Mockingbird. It is a remarkable story of modern-day generosity; citizen to citizen. It is a remarkable story of faith in a friend’s potential. It is a story of belief in an individual’s ability to make a difference to the outcome of another’s creative dreams and aspirations; and, thereby, create a richer, better world for all of us. Most of us are not in a position to be as generous as the Browns, but we all have immense power to contribute a little to artistic friends and communities. and some of us organise writing contests, cater for a friend’s concert, donate to crowd-sourcing; and even provide the most basic of support, in the form of very welcome meals to ‘starving’ artists. And, in return, our lives are enriched by wonderful music and writing and art. Not every artistic endeavour will reach the dizzying heights of To Kill a Mockingbird, but that does not mean those works we do support, and encourage, are any the less valuable to the general enrichment of humanity. Imagine, if you will, a world of people, well sponsored/cared for by each other, and, thus, all so busy with creative activities that there is neither the time nor the energy to pick up guns and warmonger; to de-create. Imagine! Imagine that with just a ‘little’ it may be in our power to create that world. Mmmm….not sure what would happen to the laundry and the dusting and the weeding and the planting in such a creative scenario but, I guess, they could be squeezed in somewhere. As I was completing this post, the news came through of the death of Michael Brown. Here is a link to the New York Times article. This entry was posted in Animals, Art, Books, Domestic, Faith, Memories, Music, poetry and tagged ageing, artists, © silkannthreades, Bumble, catering, contests, creativity, crowd-sourcing, friendship, gifts, Harper Lee, Helen/Tiny Lessons blog, imagination, Juliet Batten, laundry, Maureen Sudlow, meals, Michael Brown, miniature schnauzer, musicians, painting, planting, Playamart Zeebra Designs, reading interrupted., Sharifah Hamzah, Sophia Stuart, tableofcolors, To Kill a Mockingbird, Vickie Lester, warmongering, weeding, working dogs, writing on July 2, 2014 by Gallivanta. Yesterday was the sort of sublimely beautiful, fair-weather day that makes me want to drop everything, hop in the car and drive forever. Maybe not quite forever, but at least for as long as it takes me to explore my country from end to end and side to side. But, being the annoyingly responsible person that I am, all we managed to do was a couple of hours of wonderful exploring of the Styx River, and, then, we dutifully came home, in time to bring in the laundry, make the dinner, feed the animals, wash the dishes, dry the dishes and turn the dishes over….actually, we have a dishwasher but that doesn’t make the domestic routines any less domestic or routine. So, having traversed that hump in my grump, I sat down and listened to the sublime music of Mr Composer (truly, truly, I can never equal your genius) and started to research where our little gallivant had taken us. Our first stop was the Janet Stewart Reserve on the Styx River; a destination I chose on the spur of the moment, as we were leaving our driveway. This was our first visit to this Reserve. 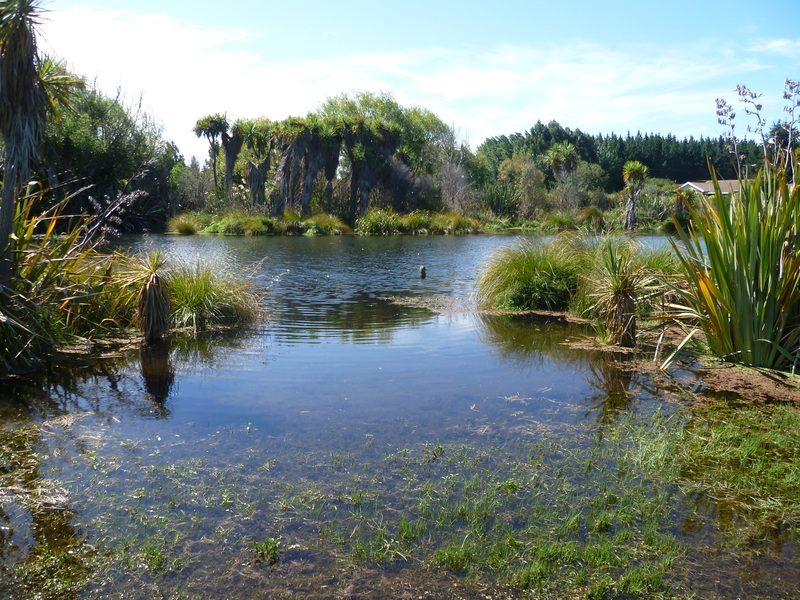 It was created as part of the Styx River Project which has, amongst its aims, the creation of a source to sea experience and the establishment of a viable spring fed river ecosystem.The Janet Stewart Reserve, covers land which runs parallel with the Lower Styx Road for approximately a kilometre. It also borders part of a very busy main road; Marshlands Road. 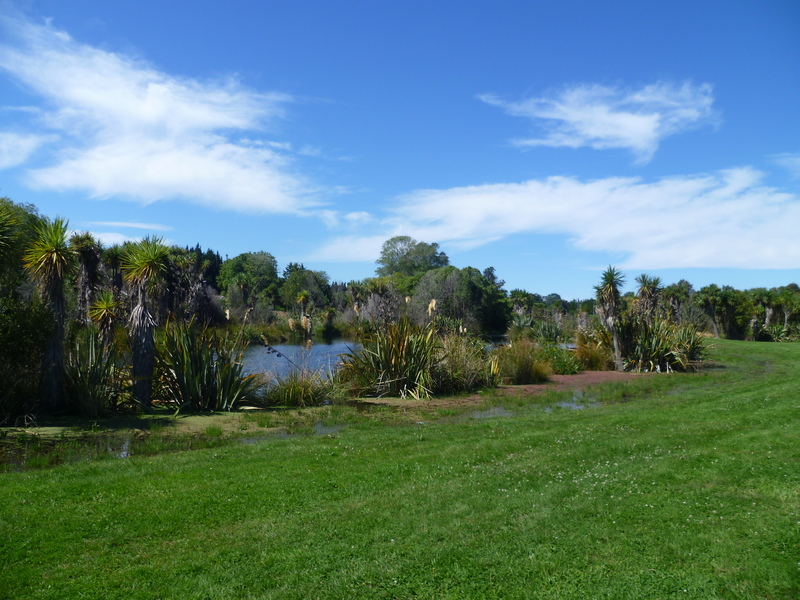 The Reserve is home to a specially designed and planted harakeke garden. 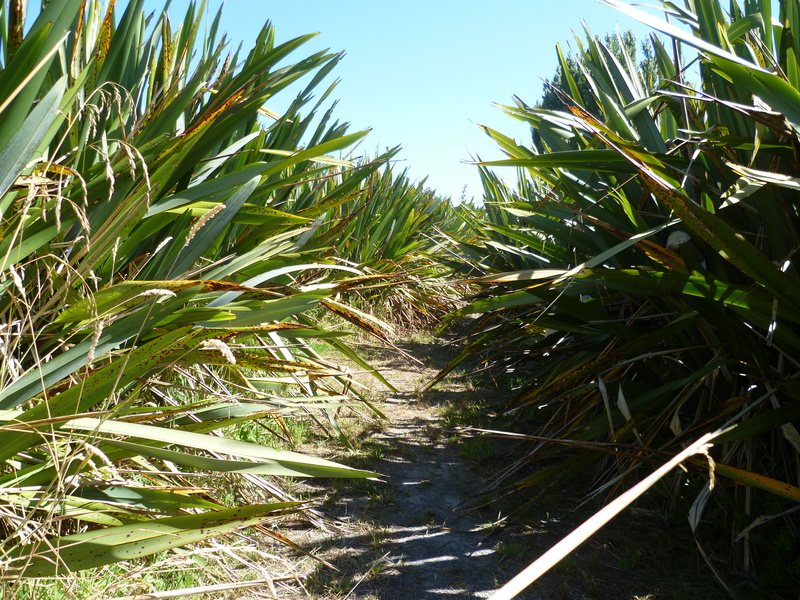 Harakeke is a type of flax which is used for Maori weaving. 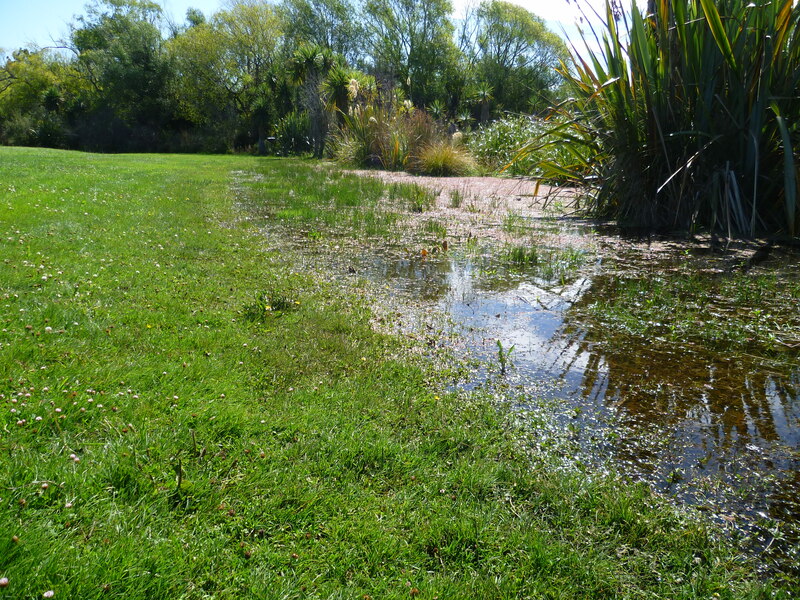 The garden is considered a taonga, or treasure, for the Christchurch weaving community. At the entrance to the garden there is a fascinating woven sculpture. 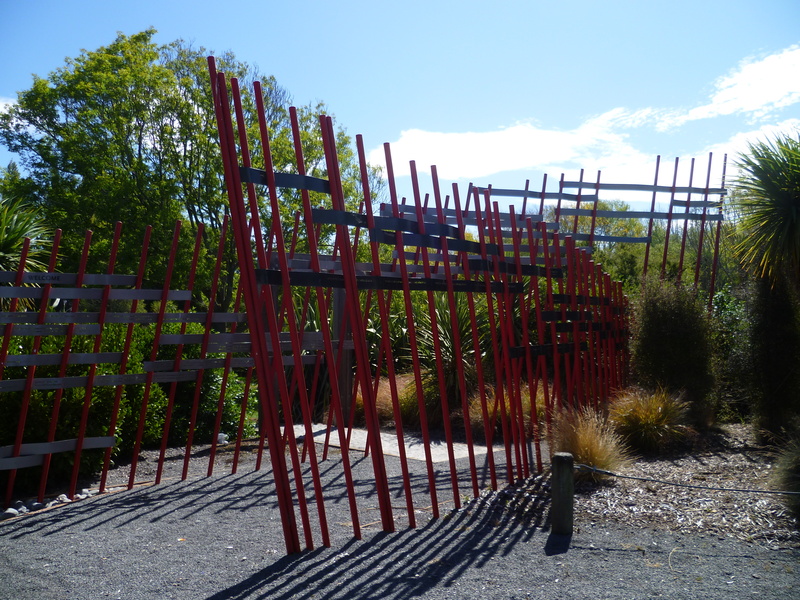 When you approach the sculpture you realise that the story of harakeke is crafted into the structure. 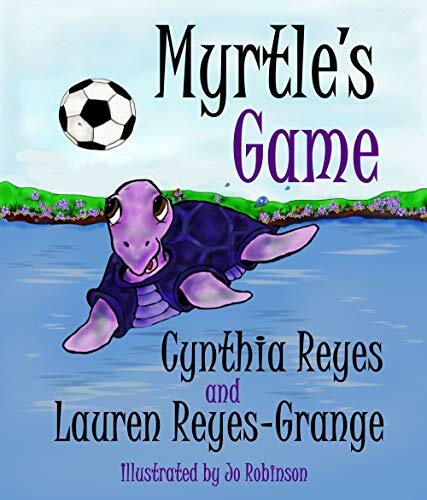 As you read, you can hear traffic in the distance but the dominant background music comes from the birds, hidden in the bushes and the thick vegetation on the banks of the river. The Janet Stewart Reserve is a place of creativity, conservation, calm, beauty, nourishment, renewal and responsible stewardship. Who then is Janet Stewart whose name honours this place. A politician, a composer, a musician, an opera diva, a writer? Nope, not all. Janet Stewart was that greatest of all creative geniuses; a Mother.Nothing more, nothing less. 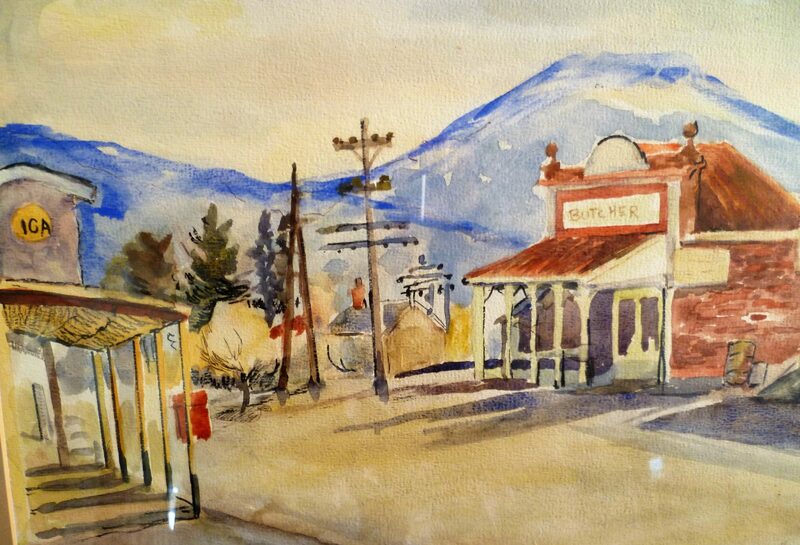 When Edmond Stewart died in 1993, he bequeathed his land to the City Council for the purposes of creating a reserve to be named after his hardworking, resourceful mother, Janet Stewart. The Janet Stewart Reserve is a son’s loving tribute to his Mother. A living symphony of sound and light and wonder, and music to my ears. Next time, I have the grumps I will remember Janet Stewart and her Reserve and all will be well. 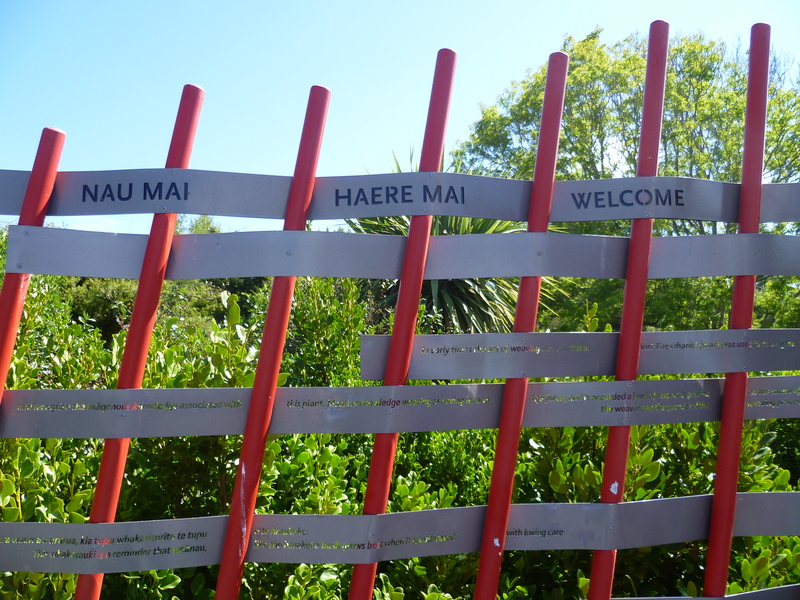 This entry was posted in Animals, Baking, Domestic, Flowers, Gallivanting, Memories, Music, Rivers, Sea, sunshine, Trees and tagged © silkannthreades, botanic, change, Christchurch, community gardens, composers, craft, creativity, domesticity, gardens, heritage, laundry, Maori names, nature, parks, peace, perspectives, sculpture, writers on February 4, 2013 by Gallivanta.